A durometer is a device used to measure the hardness of a wide variety of materials, from soft rubbers and polymers to hard plastics. 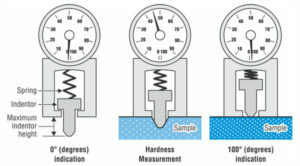 Hardness measurements are used for quality control or comparison purposes. Durometers with varying levels of sophistication and accuracy may be used depending upon the application. Analog hand-held durometers with or without peak indicators are used for basic testing. They can be mounted to a durometer operating stand to eliminate load and speed testing variables. Motorized auto loading durometer test stands offer digital speed control, and temperature-controlled chambers. The basis of a durometer consists of combinations of different indenter shapes and forces applied. Industry standards dictate the geometry and design of different durometer types, also known as durometer scales. In the United States for example, ASTM D-2240 outlines Shore durometer scales, environmental requirements, and sample sizes used in hardness testing. 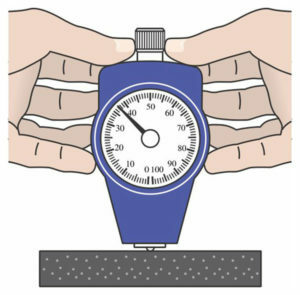 The appropriate durometer scale must be chosen for the material being tested. Two common types include Shore A and Shore D. Shore A is typically used for normal rubber and soft plastics while Shore D is used for hard rubber and plastics. Asker C is another common scale used by athletic shoe manufacturers. 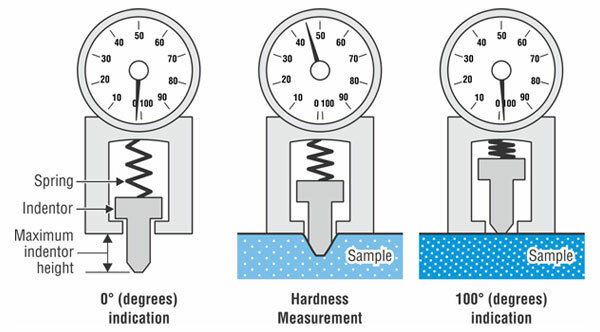 Hardness testing methods vary depending on the type of durometer being used, but the samples being tested must all share certain characteristics. Samples should be at least 6 mm (1/4 inch) thick, flat, and parallel (Thin samples are stacked together). 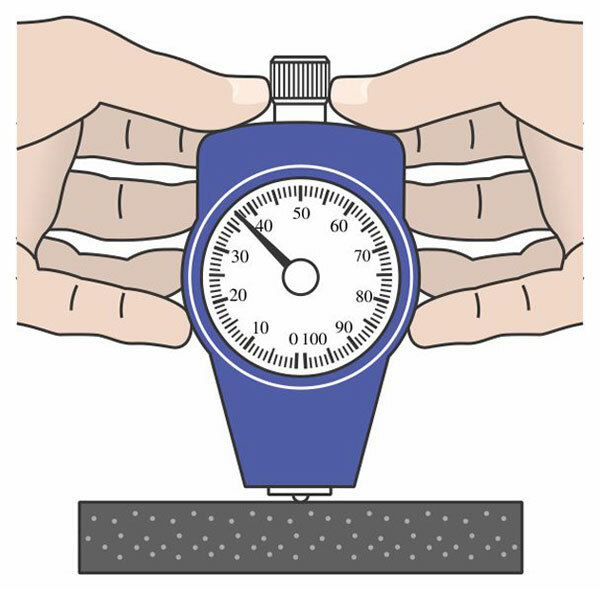 If using a handheld durometer, pressure is applied gradually with both hands. However, constant load systems should allow the durometer to descend at 3.2 mm/sec (1/8 inch/sec). In both situations, it is important to apply pressure smoothly and without shock load. When repeated measurements are being made on the same samples, test points should be separated by 6 mm (1/4 inch) and 12 mm (1/2 inch) from the edge of the sample. Hoto Instruments specializes in durometers, constant load stands and motorized, fully-featured auto durometers for scales A, B, C, D, DO, and E for rubber and plastic.